(CNS): While much of the wider community may still be feeling the fall out of years of economic hardship according to the latest report published by the Economics and Statistics Office at the end of last year Cayman’s economy was on the up in 2012. The Cayman Islands’ System of National Accounts Report 2012 which presents the economic performance of the various industries contributing to the country’s GDP found it grew by 1.4% as most industries posted economic growth. Finance minister Marco Archer said he was pleased to see 16 of the country’s 18 industries experienced growth above the 0.9 percent posted in 2011. “With this GDP growth, per capita GDP in current prices amounted to CI$45,896.40,” he said. The financial and insurance services industry recorded growth of 1.5% in 2012, the strongest growth recorded since 2007, on the back of the expansions in insurance services (4.6%) and other financial services (2.9%). The other industries which performed strongly in 2012 are administrative & support services activities which consist mainly of security and car rental services (4.6%); manufacturing (4.0%); mining & quarrying (3.8%); and agriculture & fishing (2.9%), the report found. The expansion in the domestic economy however was tempered by declines in electricity, gas & air conditioning supply at -1.1% and real estate activities at -0.1%. Financial and Insurance Services maintained its position as the largest single contributor to real GDP in 2012 accounting for 42.1 percent of total GDP. The ranking of the industries in terms of contribution to GDP remained unchanged. (CNS): A 45-year-old police officer has been arrested for blackmail, the RCIPS said Thursday evening. According to an RCIPS spokesperson, the officer has been detained in custody after his arrest on suspicion of blackmail and breach of trust in contravention of the Penal Code and Anti-corruption Law respectively. The spokesperson said this was as a result of a joint investigation by the RCIPS Professional Standards Unit and the Anti-Corruption Unit but they have not yet stated when the alleged offence took place, where or in connection with what. The officer has, however, been suspended from duty. This is the second serving police officer arrested under the Anti-Corruption Law. Elvis Kelsey Ebanks was charged with taking a bribe from a Filipino national in exchange for not arresting him for theft in 2012. The case against Ebanks (29), who denies soliciting the bribe, opened in Grand Court in November but was adjourned part way through when the judge dismissed the jury as a result of possible prejudice that may have occurred in the case. The trial is expected to re-open next month. While the women’s game gets nothing like the recognition given to the men’s game around the world, Webb said women’s football has long been a source of pride for CONCACAF, especially as the United States has created a global model for success. On Thursday Webb confirmed the confederation’s continued commitment to women’s football, as he noted the consistently strong programmes also established by Canada and Mexico. 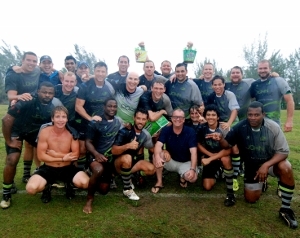 Webb believes that the sport can continue to grow in the Caribbean and Central America. Jamaica has demonstrated robust progress, hosting and finishing fourth at the 2013 CONCACAF Women’s Under-17 Championship. Many of the standouts from that team are on the Reggae Girlz’s current under-20 roster that kicked off the tournament at the Truman Bodden Sports Complex. Guatemala will participate in its third straight under-20 CONCACAF finals, a Central American record. The United States is the only CONCACAF nation to qualify for every FIFA U-19/20 Women’s World Cup, but the FIFA vice president is confident that others can replicate that path. “We have to invest in the game, particularly in the long term development of women’s football,” Webb added. The CONCACAF Women’s Under-20 Championship, which runs January 9-19, will see the top three teams automatically qualify for the 2014 FIFA U-20 Women’s World Cup in Canada. It presents a great opportunity for Cayman’s players because football scouts are on islands but the country will also benefit as the games will be televised across the countries involved in thetournament. More than 300 people, including players, coaches, officials, administrators, supporters and CONCACAF staff, are in Cayman for the contest, boosting the local economy. The Marriott, the Comfort Suites and the new Holiday Inn are housing the teams and associated delegates. The tournament comes just a few months after Cayman hosted a truly successful U-15 Boys development tournament in August, in which more than 20 teams visited and took part. 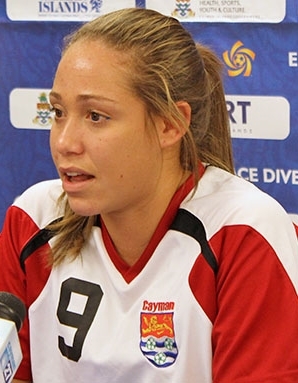 With high hopes that Cayman’s women can make the semi-finals, getting a shot at one of the qualifying spots, organisers are urging everyone to go out and support the home team. The TV schedule for the tournament is as follows but all games are at the Truman Bodden Sports Compex and entrance is free. See CONCACAF website for details of all eight teams here and the full schedule and results here. TBSC will televise Thursday’s matches Guatemala v. Jamaica at 5pm and USA v. Costa Rica at 7:30pm and on Friday Honduras v Trinidad at 5pm and Cayman Islands v. Mexico at 7:30pm. (CNS): Scientists from the American Museum of Natural History have discovered that biofluorescence is widespread in the ocean and is particularly common in cryptically patterned and well camouflaged fish which live in coral-reefs. The researchers began this voyage of discovery after spotting a glowing eel on a reef in Little Cayman. The experts were filming fluorescent coral and gathering pictures for an exhibition but the fluorescent, green eel triggered a series of expeditions to the Caribbean and Pacific which led to the revelations that biofluorescence is widespread in fish and 180 species have now been counted that glow in the dark. 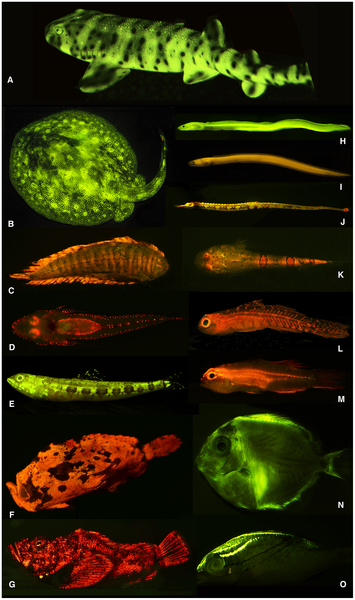 “Our findings identify a widespread and previously unrecognized evolutionary phenomenon that provides new insights into the evolution of marine fishes and the function of light and visual systems in a marine environment, as well as providing a framework for the discovery of additional novel fluorescent proteins,” the scientists involved in the work said in a report published on the specialist website the public library of science. Most of the fish species the scientists identified are camouflaged, so they are nearly invisible to humans. But the researchers say they think that these species can probably see fluorescence easily so can see each other during meeting. Human divers can see it, but not very well unless they shine an intense blue light on the organisms, producing higher levels of fluorescence, as the divers did on the reef off Little Cayman. Whether or not we refer to the local police as a force or a service, all of us need to know that when members of the RCIPS use force it is done so in a reasonable manner and lawfully. The police themselves are and must be subject to the rule of law. An unruly police force (or service) is equally as bad as runaway crime and the Cayman Islands is currently teetering on the brink of both. At this stage the events of New Year’s Day following an armed hold-up at a George Town jewellery store, when Police Commissioner David Baines chased after the suspects in his truck, are not entirely clear. It is certain that the commissioner caused the suspected robbers to crash and then he struck at least one man with his vehicle after the suspects ran off from their immobilized car. It is also a fact that the man who was injured remains in hospital at present over a week later. We don’t know how badly he was injured or even if he was one of the men that got out of the getaway car. While many are very supportive of the quick actions taken by Baines in apprehending the suspects, it is vital that a transparent and open investigation into what happened is made by an independent body to establish that what the commissioner did to stop the robbers was reasonable. Baines should know this too. As a long serving officer with decades of experience in the UK, he will be well aware that it is normal there and in most jurisdictions for an investigation to commence under such circumstances. He may very well be found to have acted entirely lawfully, even heroically and befitting of his recent royal gong, but it would be wrong for the authorities not to properly examine and publicly explain what happened. It is perfectly reasonable for the public to ask if chasing men on foot with a large SUV is ‘reasonable’, especially when it appears that one man was run over and badly injured, even if Baines’ intention was merely to prevent their escape and not to hurt anyone. Given that the premier in his role as home affairs minister now has a greater part to play in the administrative side of policing, calls from him for an open enquiry would carry significant weight. But so far the country's leader and his ministry have been quiet about the incident, as have all local officials questioned about the issue. Just days after the senior cops’ actions, several police officers engaged in a high speed pursuit through the streets of George Town, when it appears at least three cars took off after a suspect who was wanted on a warrant for failing to turn up to court. The man was not a violent offender but charged with burglary. Yet, in the wake of their boss's actions, it seems that they too were encouraged to take after the suspect, careering through the streets at high speed, according to some accounts. Now, without doubt the offender should not have torn off at such dangerous speeds and he should certainly not have commandeered another car, but the question has to be asked whether it was really necessary for three police cars to pursue the perpetrator, given that the police helicopter also had a lock on him, with the resulting damage to no less than seven cars, including the police vehicles. The air support unit demonstrated on a previous occasion how effective it can be in tailing speeding getaway cars much more safely than a high speed car chase on the streets. The police have already been found by the courts to have caused the death of one young man because of a high speed chase, and there have been other reports in recent years of the police running over people in the process of an arrest. A police officer was also sacked after he was convicted of breaking a man’s arm during an arrest, although he was recently acquitted by the Court of Appeal. More often than not the victims of police abuse, or misuse of their powers, are not in a position to do much about it. Lawyers are expensive and most victims are petty offenders with low education levels who do not have the wherewithal to take legal action. Crime continues to plague Cayman, even though the authorities lock up a significant number of people, placing the jurisdiction close to the top of the world’s list for per capita rate of inmates. There is no doubt that the community is calling for action as the police struggle to keep a lid on violent crime in particular. But this does not mean that the police can bend the law or exceed their powers as a result. Neither prison nor the increasing amounts of legislation that undermine civil liberties seem to have had much effect on the local crime rate, but nor will a police service that thinks it is above the law. The causes of crime are exceptionally complex and Cayman is paying the price now for many years of neglect of the social and economic factors that have produced a generation of criminals. Many have scant regard for law and order and others simply cannot function in normal society because of the neglect and systematic abuse in their past. The police are not to blame for crime but they do have a part to play in reducing it. Critical to good policing, especially policing by consent as is the norm in any democracy, is the community’s trust in the police service’s integrity. It can certainly be argued that, at present, trust in the RCIPS is very limited. The fact that at least three men were prepared to hold up a jewellery store in broad daylight on a busy cruise ship day with hundreds of people around shows that either they simply believed they would not be caught or, more disturbingly, even if they were caught they would not be convicted. And it is here where the trouble lies for the police. 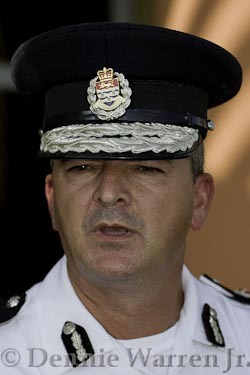 A combination of poor communication with and lack of understanding about the complexities of Cayman society by many officers, the poor management of evidence, competency levels and training, as well as the failure of the Office of the Director of Public Prosecutions to direct the police when there are problems with cases, has, among other issues, led to a number of collapsed trials and acquittals by the Court of Appeal. What the RCIPS needs to do is build the trust of the public, train its officers and answer the community’s continuous and loud calls for police on the street and on their feet — not in their cars. The RCIPS needs to be in a position to collect genuine witness evidence and make better use of technological, scientific and forensic evidence to support cases going through the courts. Safe convictions of perpetrators get the right people off the streets and send a message to others, but when the criminals believe that the police are not capable of steering cases to conviction and when they know the broader community does not trust them for a catalogue of reasons, the police will continue to fail in their struggle to fight crime. Unlawful action by the police will not help; it will only make a bad situation worse. If the actions of the police commissioner on New Year’s Day are not properly and openly examined, the message that will be sent to the rank and file of the RCIPS and the local criminals does not bode well for the future of crime management in Cayman. John Doak Architecture Iguanas are the current Alex Alexander Memorial Trophy Champions. The Heineken Charity Shield which was decided back in December (and won by the John Doak Architecture Iguanas RFC over the previous holders the Advance Fire and Plumbing Buccaneers RFC) officially marks the start the Rugby XV’s season but the Premier, and most coveted trophy is the Alex Alexander Memorial. The current holders of the Alexander Memorial are the Iguanas RFC but the Buccaneers, Queensgate Pigs Trotters and Fidelity Bank Cayman Storm will be looking to unseat the current champs. Winning the league is no easy feat as teams will suffer from injuries, absent players and of course hard hitting rugby and with an evenly balanced league it will be anyone’s guess as to who will march out to be early favorites. (CNS): Two legal challenges to the detention of suspects bypolice that saw the RCIPS falling foul of the Bill of Rights have resulted in major amendments to part of the Police Law (2010), which is scheduled to come before legislators when they meet later this month. The new bill will prevent police from detaining suspects arrested without a warrant for more than three days without the intervention of the courts. It will also require the arresting officers to justify and show evidence for detaining anyone they have in custody. The change makes the law more compatible with Cayman’s Bill of Rights, which requires that people who have been arrested on suspicion of a crime are brought promptly before the courts. The law currently empowers police to detain suspects for up to 72 hours from the time of arrest when there is insufficient evidence to charge the person but where detention is necessary to complete an investigation. But it also allows a chief inspector or higher ranking officer to extend the detention for an additional 25-hour period before going to court. However, in the case of Canute Nairne the courts found that the detention of the suspect for the fourth day was incompatible with the constitutional requirement of promptness in bringing detainees before the court. In another case, which related to men arrested on suspicion of the Little Cayman robbery at the end of 2013, a local attorney drove the release of the suspects when he filed a writ of habeas corpus. As a result of what is understood to be a lack of evidence, the police released the men without the need for the legal hearing as it seems they were not in a position to legally justify continuing to hold the suspects. With the courts finding in Nairne's favour and the obvious difficulty for the police in justifying the detention in the Little Cayman case, the incompatibility between the police law and the Constitution came into stark focus. As a result, under the Constitution, legislators must move quickly to alter the legislation to bring it in line with the Bill of Rights, which as part of the Constitution is a higher law. Therefore, the power to add on the additional day of custody by a senior officer will be repealed. The amendments will also address and clarify the procedures police must follow when taking anyone into custody without a warrant. Custody officers will now be required to make periodic inquiries regarding the detention of suspects and allow the detained person to make oral representations regarding that detention. The custody sergeant must then record those representations and the grounds for the suspect's continued detention. The amendments also clarify how suspects who are in hospital or who require medical attention during their arrest should be treated. James Stenning, the local attorney who filed the habeas corpus writ in the Little Cayman case, said he welcomed the proposed revisions to the Police Law (2010) but lamented the missed chance to modernise the legislation even further. “The amendments appear to attempt to contribute to ensuring that the state, which includes the RCIPS as an agent of the same, is in compliance with our Constitution’s Bill of Rights. This observed, I fear the real impact of any amendments to the police law may well be lost … until law enforcement agencies appreciate the necessity at a senior management level to invest in ensuring observance of these proposed changes to the law, as well as residents' legal rights generally,” he said. Stenning said the proposed changes were a step forward but Cayman had missed the opportunity to adopt the majority of the Police and Criminal Evidence Act 1984, known as “PACE” within the UK, as Cayman’s police law. He also said that the adoption of PACE would ensure less declarations of incompatibility with the Constitution’s Bill of Rights, given that potential issues are highly likely to have been encountered and addressed by the UK courts already, as PACE’s compatibility has been considered against the UK’s Human Rights Act 1998 over the past 16 years. The changes to the law will not prevent the police from detaining genuine suspects but it will ensure that every step of the way the detention is properly justified and recorded and that the courts are involved at the earliest opportunity to confirm the legality of any arrest. (CNS): A spokesperson for the RCIPS has confirmed that the involvement of the Commissioner of Police in the arrest of a robbery suspect is under investigation. David Baines reportedly rammed the getaway vehicle in which three men accused of holding up a George Town jewellery store were trying to make their escape on the morning of New Year’s Day. In an interview Baines gave to the UK press, Cayman’s top cop said that when the suspects got out of their car he continued the pursuit in his Chevy Trailblazer, while they were on foot, pinning two of them against a fence while the third man ”slipped ” under his truck. That suspect remains in hospital but the authorities have not yet confirmed what are understood to be severe injuries. Although Baines, who was listed as an OBE recipient in the UK New Year’s Honours list just the day before, was lauded as a hero locally and in the British media when he helped to foil the suspected robbers' escape, there were concerns raised that going after the men who were on foot in his vehicle may have been excessive. Following the submission of questions from CNS and other media houses, the police released a short statement on Wednesday evening about the incident, in which Christopher Myles and James Mclean as well as an unnamed third man were arrested following the daring daylight hold-up at Diamonds International on 1 January. The statement came on the same day that Ezzard Miller, the independent member of the Legislative Assembly for North Side, had called for the same vigorous inquiry into the circumstances of the arrest and the use of force in this situation, as was the case against a local officer who was charged with assault following an off-duty arrest..
Caymanian officer, Rabe Welcome, was suspended and charged after he broke the arm of a suspect armed with a machete during an arrest at a gas station while he was off duty. Welcome was eventually convicted but then acquitted by the Cayman Islands Court of Appeal, but by that time he had already lost his job. The police confirmed that the third man, who remains in hospital, has now been interviewed but he has not yet been charged. The RCIPS spokesperson also confirmed that access to him by his family had been limited because police had been unable to interview him. It is understood that the man’s condition prevented police from talking with him. “At the initial stages of enquiry there was limited access to the suspect due to the fact that he had not been interviewed by the police, and there were concerns relative to evidence collection and contamination," the spokesperson stated. “His lawyer and family were aware of this. The subject has since been interviewed (Tuesday) and the family has visited him at the hospital,” he added. (CNS): The independent member for North Side has singled out two issues that he will be pushing hard for during 2014. First ishis intention to immediately press government to meet its commitment to deliver on one man-one vote in single member constituencies before this financial year is out. Ezzard Miller told CNS that, along with the introduction of a minimum wage, the changes to the elections law need to be implemented sooner rather than later. Therefore, he said, he and his legislative colleague from East End, Arden McLean, will be presenting two private member’s motions when the Legislative Assembly meets later this month to push government’s hand on both issues. Talking about the need to make the changes to the election law as soon as possible, Miller said he expected the government to welcome the motion but he had been disappointed with the “shocking absence” of this and the minimum wage issue in the government’s legislative agenda presented during the budget debate for this year. “The election campaign took place less than one year ago and every person elected in the current government, including the C4C members, campaigned in favour of one man, one vote, in single member constituencies almost as a matter of urgency,” he said. “On that basis, coupled with the fact that there are members of Cabinet who launched their political career with the OMOV campaign and who got elected … as a result of that involvement ahead of the referendum in 2012,I expect this motion to be welcomed with open arms at the next meeting,” he added. So, keen to ensure that the necessary amendments are made to the election law as quickly as possible, Miller said that if the necessary legislation is not on the floor of the LA before 30 June, he was prepared to take on the necessary time and expense of tabling his own private member’s bill. This would see Miller finance the cost of drawing up the necessary amendments to the legislation and present government with a ready to use white paper. while the next election may be well over three years away, an unexpected by-election could happen at any time if a serving MLA were forced to step down, chose to resign or pass away. The Elections Office has said it is ready to implement single member constituencies but there are some boundary issues to be addressed over constituencies bordering George Town and Bodden Town. 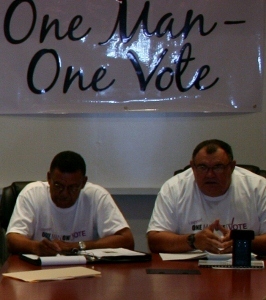 Kearney Gomez, the former supervisor of elections, had stressed a preference for the maximum time line possible for an education and awareness campaign about that, as well as the general changes that OMOV in single member constituencies would bring for voters. Miller said the time was now and he would do everything in his power to drive the necessary legislative changes within the next few months. All of the PPM and Coalition for Cayman members, as well as both Miller and McLean, have expressed their full support for the change, even if at this stage no time line has been spelled out by the government. Even Opposition Leader McKeeva Bush has accepted the fact that the new voting system is coming, which leaves the government with no reason to postpone the legislation. However, when it comes to minimum wage Miller has a greater struggle on his hands. Despite support from key PPM members of government during the election campaign, Coalition for Cayman member Tara Rivers, who is now the labour minister, has expressed her opposition to it. Nevertheless, given the support of Premier Alden McLaughlin, Miller said his motion on this issue should also be welcomed by the government. “The premier is on record as saying that not introducing the minimum wage is one of his major regrets,” Miller told CNS this week, noting that McLaughlin was now in a position to put that right. The independent member said he expected there would need to be some research into the lowest possible wage rate. Acknowledging that this would not be high, he pointed to government’s lowest hourly rate of around $7 as a probable starting point.But whatever was considered reasonable, he said, it was important to implement the rate as a social policy and deliver a message. The North Side member was convinced, he said, that the way the labour law was written, as a result of pressure from the business community and its lobby groups, had created difficulties for successive governments, who have all supported minimum wage in principle, enacting the necessary changes to the law. He said Cayman needed to put a stop to unscrupulous employers who know full well that paying someone $4 an hour makes it impossible for them to live in Cayman. Miller said that the lack of a minimum wage had driven down wages over the years to such an extent that more and more people were forced into poverty and had fuelled the increase in foreign cheap labour, which is at the heart of local unemployment. “Businesses should not be allowed to rely so heavily on constantly reducing their labour costs to provide a source of profit,” he told CNS. Illustrating his point, Miller explained that in 1969 a bartender at the Holiday Inn was paid around $8 per hour and allowed to keep the tips he earned. At that time the cost of a beer was a $1. Today, he said, at the Ritz Carlton, which sits on the site of the former Holiday Inn, beer now costs $8 while jobs for bartenders are advertised at $4 per hour with just a share of gratuities. “There is something very wrong with that equation,” Miller said, as he called on government to seize the opportunity to do what government after government since the 1980's has been unable to do. CNS): Those advocating for the decriminalisation of ganja in Jamaica are preparing to launch a cannabis growers' association, as momentum builds towards the establishment of a formal ganja industry in Cayman’s neighbouring island. As politicians in Cayman remain tight lipped in the face of a campaign here to open the discussion on purely the medical use of cannabis, Jamaica is preparing itself for the financial windfall many believe will come once legislation changes. Encouraged by the legalisation of the drug in Colorado and Washington and in Uruguay, the development of a local, regional and international cannabis industry could generate billions of dollars for the Jamaican economy. The Cannabis Future Growers and Producers Association will be launched later this month, according to reports in the Jamaican media, at a major stakeholders’ forum for the various entities planning a future in ganja at the University of the West Indies in Mona, St Andrew. "We have invited representatives of the various organisations to come together at the forum to take their ideas forward," Paul Burke, a spokesman for the forum organisers, confirmed Wednesday. "The launch of the Cannabis Future Growers and Producers Association is expected to be one of the outcomes of the forum."